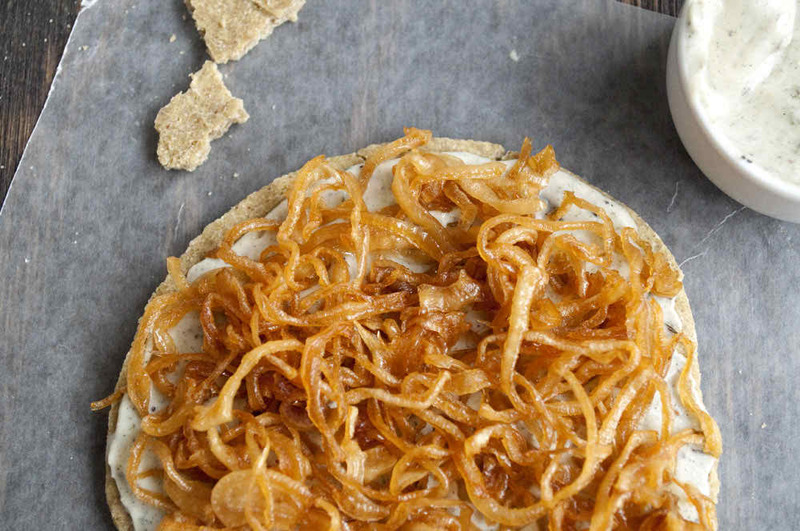 Crispy spiced young coconut bacon, cultured peppercorn cheese and soft caramelized onion come together on a raw buckwheat crust to create this gorgeous explosion of flavor. It’s raw pizza with a gourmet twist! This recipe has quite a few steps involved with various ingredients needing dehydration or culturing, but if you’re looking for raw gourmet at it’s finest this recipe is for you! 1) Grind buckwheat groats, psyllium, and salt into flour. 2) Blend all wet ingredients. 3) In a food processor, slowly pour wet ingredients into flour. Process until doughy. 4) Using buckwheat flour, roll out dough just like you would any other pizza dough. Shape and dehydrate at 105〫F for 24 hours. 1) In a high-speed blender, blend the first four ingredients until creamy. 2) In a glass jar, place cheese mixture and let sit uncovered in a dark, slightly warm (90 degrees) place, for about 18 hours (the longer it sits, the more sour it will become.) If you’d like to strain your cheese, reference my Leek and Herb Cheese for instructions. 3) Once fermented, mix in the remaining ingredients. Set aside. 1) Mix all ingredients together and place on a non-stick dehydrator sheet until golden brown (about 6 hours). 1) Mix all ingredients together, making sure coconut is evenly coated. Spread coconut on a dehydrator sheet and dehydrate until crispy and dry (1-3 hours). 2) Spread crust evenly with peppercorn cheese. 3) Top cheese with caramelized onions. 4) Sprinkle generously with coconut bacon.